After 20 years trading and making jewelry, Yiwu now becomes the biggest jewelry wholesale hub in China. About 3200 wholesale stalls. 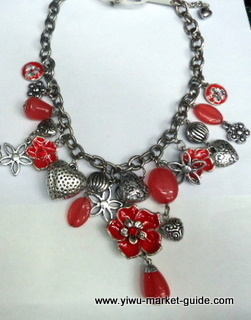 Yiwu is mainly for cheap fashion jewelry. However, as more and more jewelry business came in, in order to keep each one's products different from its competitors. Now there are also quite a few stalls for classic jewelry. This article just helps you get some rough ideas by giving a few examples. You can evaluate the potential using your own expertise. Because the prices are fluctuating due to material , labor cost, currency exchange etc. The prices here can only serve as reference, NOT actual prices. 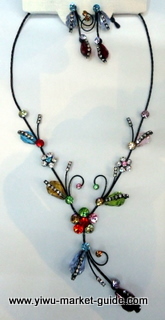 Variety for classic jewelry is not as that big as fashion jewelry. But as the jewelry market here is big, so you can still easily find a dozen stalls only for classic jewelry. 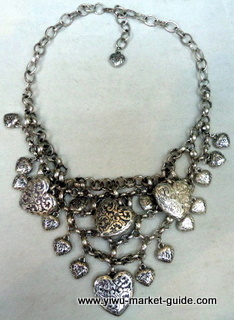 This antic silver plated piece is about 2.30-2.80 USD. This classic jewelry is about 3.50-4.00 USD/per.With some stones. classic jewelry with crystals wholesale in Yiwu market. This crystal classic jewelry is wholesaling at 2.30-2.80 USD/per. This piece is about 3.30-3.80USD/pc. This piece is wholesaling at 3.40 - 3.90 USD/per in Yiwu market. According to our customers from Europe, the quality of these pieces in Yiwu is really of good quality. Now almost all suppliers can make nickel free. MOQ need to be at least 5 - 10 dozens per color of a one design. You can also understand it as 10 - 20 dozens of one design. You can have a few colors mixed within these 10-20 dozens. >> Return to buy from Yiwu from buy classic jewelry from yiwu China.